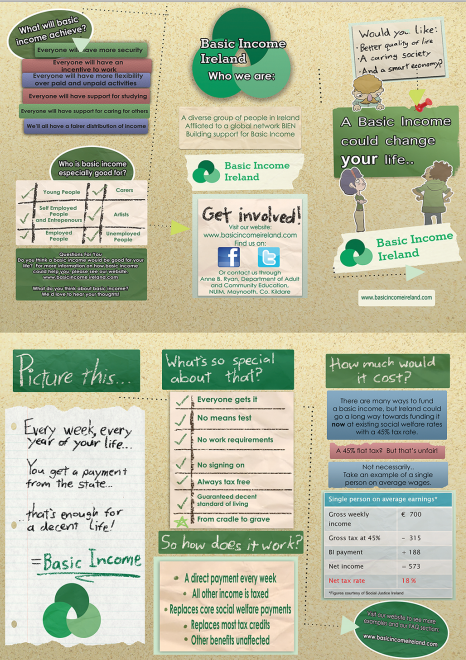 You are here: Home / News / Is it time for a Basic Income for Everyone in Ireland? What’s so good about basic income? Our present social welfare system is not working. It was designed for a different era, to provide income security for the relatively small numbers of people who became temporarily unemployed from standard jobs. Efforts to patch it up in response to new needs have been piecemeal. We need build on the old system’s principles of security and social solidarity, but to be far more inclusive. Basic financial security should be a right for all members of society. A system that could achieve this is basic income, sometimes called a citizens’ income or dividend. Basic income is a regular and unconditional income from the state to every member of society, whether they engage in paid work or not. It replaces social welfare payments, child benefit and the state pension as we currently know them. It also extends to all those who currently receive no income from the state. Ideally, a basic income would be sufficient for each person to have a frugal but decent lifestyle without supplementary income from paid work. Basic income would bring into the security net all those not served by the current system: casual and short-contract workers who get no or limited sick pay, holiday pay or pension rights; self-employed people and business owners; those doing valuable unpaid care and other work, which adds value to society and economy. For those in sporadic or seasonal employment, basic income would eliminate the need to sign on and off and the payment delays that often occur. The possibilities for welfare fraud would be minimised, with everyone playing by the same rules in a simpler system. This would also eliminate the current bureaucracy and intrusive scrutiny of claimants’ circumstances. Running a business would be a different kind of experience. The income from it would be a top-up to a basic income. People would be free to try out business ideas, and the businesses would be viable as long as they made some small profit. They might even be able to carry losses for a short time while the business got established. There would be no harm done if the business failed, because the people involved would have their UBI to fall back on. It would also allow social entrepreneurs, who are not motivated by profit, to thrive. Basic income would make low-paid work more financially viable than at present, since the pay would be a top-up to the basic income. A great deal of caring, artistic and political work is low-paid, but of direct social benefit. If a low-paid job were also dead-end, a worker would have a genuine exit possibility. Anybody, in any kind of paid work (high- or low-paid), who considered the work personally, socially or environmentally harmful, would have improved choices about staying or going. Basic income would also make shorter hours in paid work financially viable for greater numbers of workers. If more people chose shorter hours of paid work, this would create employment opportunities for others. It is possible to pay for basic income in Ireland, with our existing revenue system. It would replace almost all existing social welfare provisions (top-ups would be put in place for people with special needs), so the amount currently spent on welfare is immediately available. Employers would make a social-resources payment, to replace the present employer’s PRSI. The rest would come from an increase in income tax, which would be paid on all personal income over and above the basic income. Talk of increased income tax generates strong reactions, usually negative. But most people ignore the fact that the extra revenue taken in tax would be returned as basic income. In other words, the extra tax we would pay to finance basic income would be offset by the basic income received. Basic income would undoubtedly benefit some people more than others. Those who would benefit most are the most vulnerable in the current work-welfare system: people doing valuable unpaid work, those caught in the ‘benefits trap’, people in precarious employment, the self-employed and young people. It would increase the contribution made by those who are already very well off. But if the well-off did fall on hard times, the basic income would provide basic financial support, without welfare applications or delays. There are other options for funding basic income, which may become possible in the future. Right now, however, any government that makes a priority of basic financial security for all could afford to introduce it. Basic income is not a panacea, but one essential element of investment in a resilient and positive future for all. It would increase everybody’s capacity to cope with financial shocks and uncertainties and would improve general quality of life, while supporting many different kinds of work, with or without pay. This kind of social inclusion would foster solidarity and tolerance and reduce the resentment, divisiveness and cynicism that can occur when people experience wildly different levels of security. Increased social inclusion creates conditions for greater civic participation and deeper democracy.